In the manufacturing and automation industry, adopting new development techniques has become a key requirement for success in a highly-evolving, competitive market. As demands on product requirements increase, the inherent design risks can pose significant problems, threatening the success and reputation of those trying to keep pace. To mitigate this risk, the technique of virtual commissioning (VC) promises to reduce the significant delays and costs associated with the difficult task of system integration and commissioning. 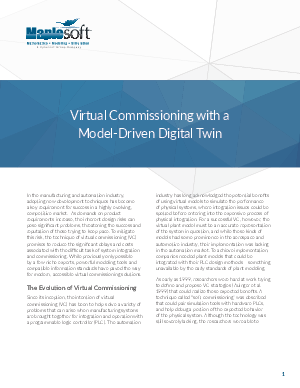 While previously only possible by a few niche experts, powerful modeling tools and compatible information standards have paved the way for modern, accessible virtual commissioning solutions.